Can you check my task 1 and give a band score? 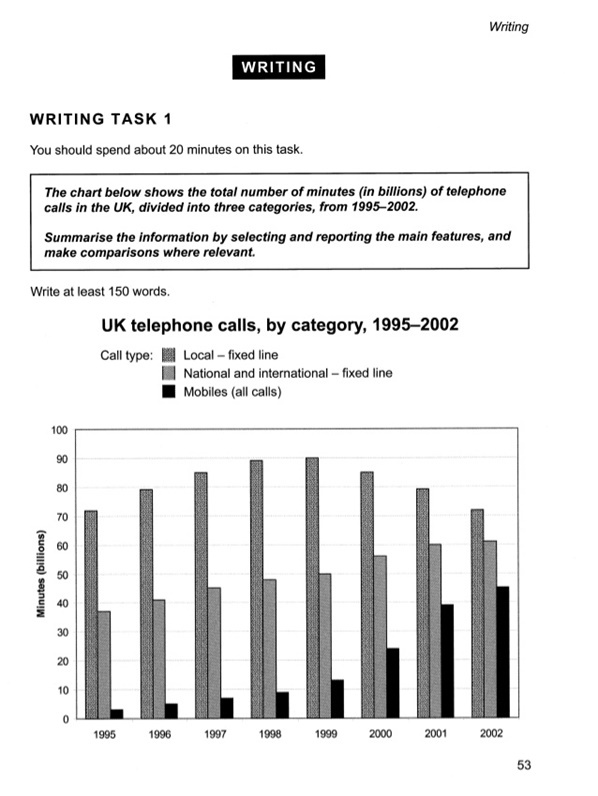 The bar graph exhibits the entire amount of time, defining in a billions of minutes in United Kingdom, separated into 3 groups: local calls, national and international calls, and mobile calls, throghout the period from 1995 to 2002. Overall, the highest point in our bar graph is the local calls, which reached a peak of 90 billions of minutes in 1999. On the contrary the lowest point determinated by mobile calls just above 5 billions of minutes in 1995. Trends of mobile, international and national calls were upward over the period, however trend of local calls was downward. Here are the key features to notice. In 1995, local calls was the most frequently used in the UK with approximately 73 bilions of minutes. Afterwards, it increased steadily and reached a peak in 1999. Neverthless, it started to decline from 1999 till 2002. In sharp contrast to this, national and international calls' trend began at about 36 billions of minutes and went up gradually to 60 billions of minutes in 2002. Could you upload the bar graph? The bar graph exhibits the entire amount of time, defining in billions of minutes in the United Kingdom, separated into 3 groups: local calls, national and international calls, and mobile calls, throughout the period from 1995 to 2002. Overall, the highest point in our bar graph is the local calls, which reached a peak of 90 billions of minutes in 1999. On the contrary, the lowest point determined by mobile calls just above 5 billions of minutes in 1995. Trends of mobile, international and national calls were upward over the period, however, the trend of local calls was downward. Here are the key features to notice. In 1995, local calls were the most frequently used in the UK with approximately 73 billion of minutes. Afterwards, it increased steadily and reached a peak in 1999. Nevertheless, it started to decline from 1999 till 2002. Moreover, in this bar graph, there is a unique trend. It is a mobile calls trend, which set off at 3 billions of minutes then rose slightly until 1999, thereafter it increased sharply to 45 billions of minutes in 2002. This trend is unique because in other trends there was no sudden increasing and decreasing trends.The bar graph exhibits the entire amount of time, defining in billions of minutes in the United Kingdom, separated into 3 groups: local calls, national and international calls, and mobile calls, throughout the period from 1995 to 2002. Moreover, in this bar graph, there is a unique trend. It is a mobile calls trend, which set off at 3 billions of minutes then rose slightly until 1999, thereafter it increased sharply to 45 billions of minutes in 2002. This trend is unique because in other trends there was no sudden increasing and decreasing trends. The bar graph exhibits shows the entire amount of time of phone calls, defining in billions of minutes in the United Kingdom, separated into 3 groups - local calls, national and international calls, and mobile calls, throughout the period from 1995 to 2002. Overall, the highest point in our bar the graph is for the local calls, which reached a peak of 90 billion s of minutes in 1999. On the other hand, contrary, the lowest point determined by is for mobile calls at just above 5 billion s of minutes in 1995. Trends of Mobile and international and national calls were saw an upward trend over the period; however, the trend of for local calls was downward. Here are the key features to note. ice. In 1995, almost 73 billion minutes were spent on local calls were the most frequently used in the UK. with approximately 73 billion of minutes. Afterwards, it that figure increased steadily and reached a peak in 1999. Nevertheless, it started to decline from 1999 till 2002. In sharp contrast to this, national and international calls trend began at about accounted for 36 billion s of minutes in 1995 and went up gradually to 60 billion s of minutes in 2002. Moreover, in this bar graph, there is a unique trend. It is a mobile calls show another notable trend, which set started off at a relatively modest 3 billion s of minutes in 1995 and then rose slightly until 1999. Thereafter, it increased sharply to 45 billion s of minutes in 2002. This trend is unique because it's the only one in the graph that shows such sudden increase. in other trends there was no sudden increasing and decreasing trends.